Before you dive head over heels into this newly discovered wonder, realize that various factors will influence everything you plan from this point forward. First, the location, layout, property size and your individual taste, budget, and purpose for landscaping will determine how much and what types of landscaping are appropriate. Remember to be realistic in your design during the planning stage. A plan does not have to be big and complicated to have a big pay-off. Setting a schedule to complete work in increments throughout several years will be much more relaxing and enjoyable than attempting everything at one time. 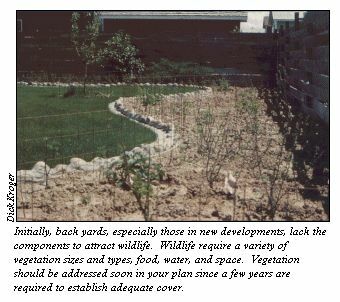 Also, understand that the vision you have in your mind about a thickly vegetated wildlife paradise may be different than what actually materializes in the first few years. 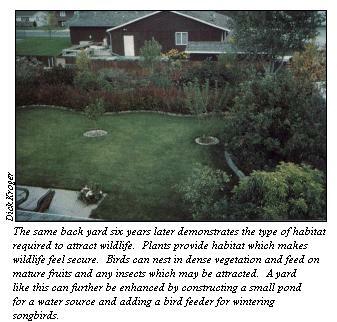 The key is that you have patience and know that eventually you will be the owner of a unique urban wildlife site created by your own innovation and hard work.